Danley Sound Labs’ Caleb Horn consists of a single, massive horn with 108 drivers with a frequency response that extends down to 30 Hz. 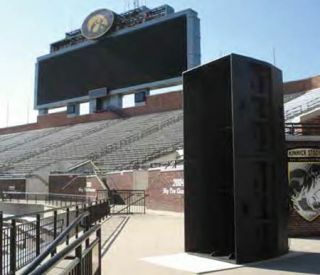 Iowa’s Kinnick Stadium is the first to install the Caleb Horn, paired with six Jericho Horns, four Danley SH-64s, and four BC-415 subwoofers. The University of Iowa Hawkeyes football team plays all of its home games in the 70,500-seat Kinnick Stadium, located on the west side of campus. It is adjacent to residences on one side and to campus buildings on the other side, one of which is the University Hospital. Although it’s fair to say that almost all Iowans stand behind the Hawkeyes (there is no pro team in the state), it’s also true that Iowans recovering in the hospital deserve peace and quiet, even on game day. When school officials became disenchanted with the lo-fi sound and poor coverage of Kinnick Stadium’s old sound reinforcement system, they worried that elevating it to modern standards would only increase game day complaints from the hospital. Those worries have been allayed—Kinnick Stadium’s new high-powered Danley Sound Labs system, the first in the world to use the massive Caleb Horn, delivers reference monitor quality audio while keeping sound energy in the bowl. The new audio system provides Danley’s famous pattern control, rich low-end, airy high-end speech intelligibility, and prevents appreciable spillover into the adjacent neighborhood and hospital. “As Hawkeye management and fans traveled to other stadiums, they kept hearing sound systems that were far better than the one they had at home,” said Marvin Smejkal, owner of Sound Concepts (Cedar Rapids, Iowa), the company under retainer with the University for audio system maintenance and operation. “As the complaints mounted, they asked us to research the sound systems in the five best stadiums they had heard. Three of the five were Danley systems, which resonated with my previous experiences involving Tom Danley’s creations—I was a huge fan of his ServoDrive subwoofer back in the 1980s and 1990s. Based on previous experience and a very impressive blind comparison, we recommended a Danley system for Kinnick Stadium.” The design, installation, and commissioning was a collaborative effort by consultant Anthony James Partners (Richmond, Virginia), with input from Sound Concepts and Danley Sound Labs. Although a range of Danley components, including Jericho Horns and BC-415 subwoofers, contribute to coverage of the entire bowl, the real hero in Iowa is Danley’s new Caleb Horn. Measuring ten feet tall by four feet wide by five feet deep, the Caleb Horn delivers precision pattern control to extremely low frequencies and provides seemingly magical coverage of the opposite stands at Kinnick Stadium. It is a single, massive horn with 108 drivers (12x18-inch drivers, 32x6-inch mid-range drivers and 64 x one-inch high-frequency compression drivers, 40x15 degree coverage pattern) with a frequency response that extends down to 30 Hz. Kinnick Stadium is the first project to use Danley’s new freely available Direct modeling software from conception to completion. Unlike other modeling software, Direct makes predictions down to subwoofer frequencies, which allowed Jones to predict the low-frequency interactions around the bowl and, critically, at a point where the stadium is open to the hospital. By carefully adjusting the timing and phasing of the subwoofers relative to the Caleb’s substantial low-frequency content, Jones placed a low-frequency null near the hospital within the Direct software. The predicted null translates to reality; although the crowd will still enjoy abundant bass, the nearby hospital is significantly spared. “In addition to being accurate across the spectrum, Direct is very quick to render and easy to use,” commented Jones. To either side of the Caleb Horn, a Danley J3 Jericho Horn paired with a Danley J4 Jericho picks up the distant sideline seating. The J4 is a highly-directional, high-frequency array of 64 compression drivers that compensates appropriately for atmospheric losses. Mike Hedden, Danley president commented, “The J4 is a very unique product. Sound from 64 compression drivers exits the large format horn via a patented combiner system. This allows unprecedented audio quantity and quality to be provided at extremely long distances. The J4 is capable of reproducing audio several octaves higher than the competition, sounds much more natural, covers a larger area, and is a better value.” Another pair of J3 Jericho Horns, one on each side, provide near-throw coverage of the main seating areas. Despite their placement on the scoreboard, which is right above the near end zone seating, Danley’s exceptional pattern control allows them to operate “without liquefying the fans immediately below,” in the choice words of Hedden. Four Danley SH-64s are time-aligned and balanced on the near side to complete the even and consistent audio coverage in the stadium. Adding icing on the cake (for those who love a little bass) are four Danley BC-415 subwoofers that complement the Caleb’s low-end output and can shake the press box windows down to 21 Hz. Arranged two tall by two wide, the configuration provides a favorable front-to-back output ratio, again keeping energy in the bowl and off the street. Lab.gruppen amplifiers with integrated Lake processing power the system with nearly 150,000 watts.